Turner Sports and CBS will once again have team-specific broadcasts for the Final Four. Here's where and when to watch the national semifinals on Saturday and the national championship game on Monday. As a TV viewer, you’ll have plenty of options for where to watch Saturday’s men’s basketball Final Four semifinals and the national championship game on Monday. 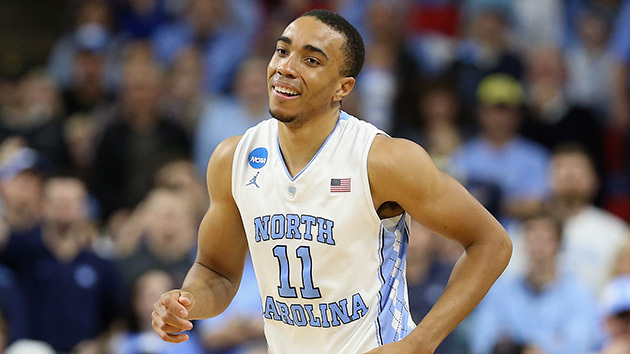 The national semifinals will tip off at 6:09 p.m. on TBS with Oklahoma-Villanova followed by North Carolina against Syracuse about 40 minutes after the completion of the first game game. Jim Nantz, Grant Hill, Bill Raftery and reporter Tracy Wolfson will be on the main call of those games. TBS’s airing of the national championship on Monday (tip off is 9:18 p.m.) will be the first time in the 78-year history of the event it will appear on cable television. Where your choices as a viewer get interesting is with the team-specific presentations on TNT and truTV for the national semifinals and title game. These broadcasts will be catered toward fans of the above teams, complete with custom music, graphics, show packaging, team-centric replays and custom halftimes with school features. NCAA March Madness Live will still provide live streaming of the national semifinals—including the team-specific presentations—and the national championship game on desktop computers, tablets, mobile phones and most set-top boxes. ​Chad McKee (play-by-play): McKee is the play-by-play commentator for Oklahoma baseball and softball and the pregame, postgame and weekly press conference host of all Sooner Sports TV football programming. Eduardo Najera (analyst): Najera spent 12 years in the NBA after playing at Oklahoma from 1997 to 2000. He is currently a pregame and postgame analyst on Mavericks Live for Fox Sports Southwest. Jessica Coody (reporter): Coody serves as the full-time lead reporter for Sooner Sports TV. Scott Graham (play-by-play): Graham is the play-by-play voice for Philadelphia Eagles preseason television games and does play-by-play for Westwood One’s coverage of NCAA college basketball. Brian Finneran (analyst): Finneran played on the NFL for 10 seasons and is a former Villanova football player. He hosts The Front Row, a morning sports radio talk show on 680 The Fan in Atlanta. Kacie McDonnell (reporter): McDonnell, a Villanova alum, is a member of the 41 Action News team in Kansas City. Wes Durham (play-by-play): Durham is an ACC basketball, football and baseball announcer for Fox Sports South and has also appeared on telecasts for the ACC Network. His father, Woody Durham, was the 40-year radio voice of North Carolina football and basketball (1971 to 2011). Brendan Haywood (analyst): Haywood played in the NBA for 15 years following his college career at North Carolina. He is now a college basketball announcer for CBS Sports. Dwayne Ballen (reporter): Ballen recently began doing play-by-play for CBS Sports Network. Balllen has previously worked for CBS Sports on the NCAA tournament and college football, the Golf Channel and ESPN, including play-by-play for college football and basketball. ​Tom Werme (play-by-play): Werme, a Syracuse alum, has worked for the ACC Network, as well as the ACC Digital Network and Raycom Sports. He also appears on ESPN, Fox Sports South and the Big Ten Network. Roosevelt Bouie (analyst): Bouie starred as a player at Syracuse from 1976 to ‘80. Donovan McNabb (reporter): McNabb played 13 years in the NFL before becoming a broadcaster for NFL Network and Fox Sports. He resigned from Fox Sports after he was suspended indefinitely in July 2015 following his second DUI arrest.